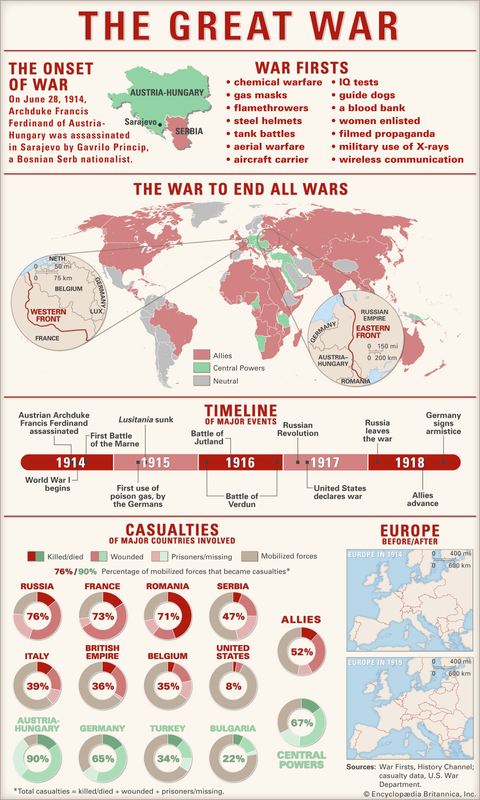 Aug. 4, 2014 marked the 100-year anniversary of the start of World War I. Today, I write this on the eve of Nov. 11, 2018 – the day that marks the 100 year anniversary of the end of World War I. Many of you will know this day as Veterans Day, Armistice Day, or Remembrance Day. 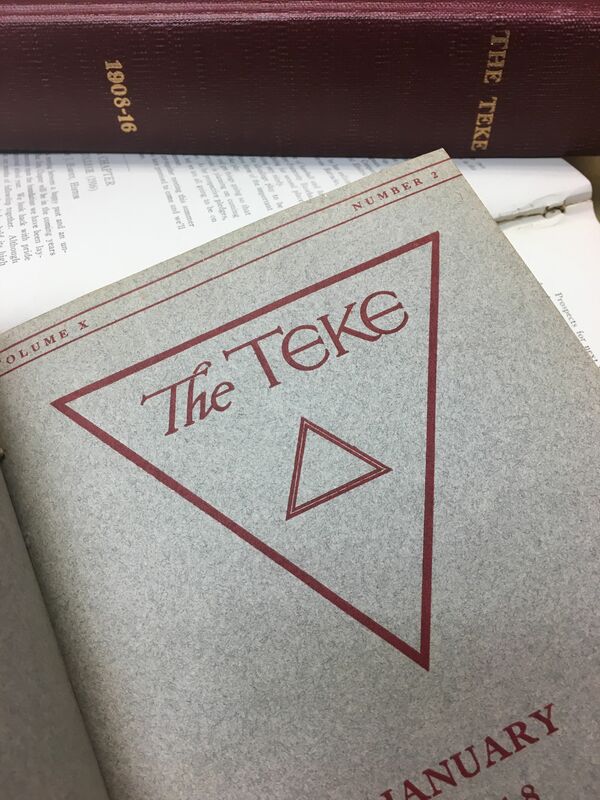 In recognition of this, we looked back through the archives of THE TEKE magazine, to a time when our great organization was a mere 20 years old. 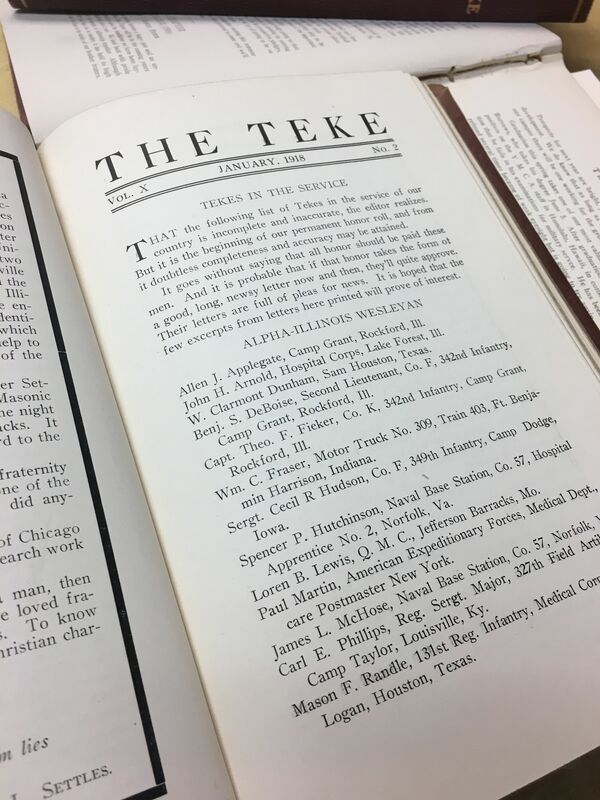 At the time the war broke out, TKE’s active chapters could be counted on fingers alone and THE TEKE regularly received and published letters from members. 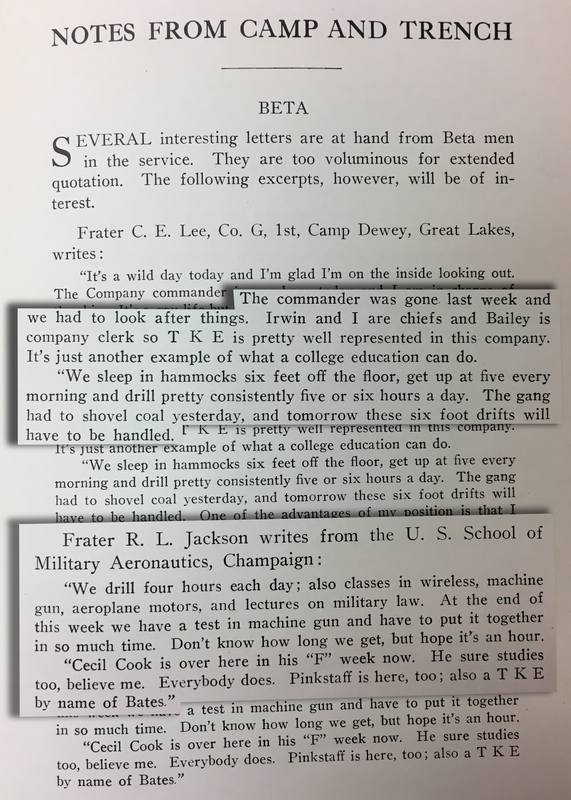 As we approach the 120th anniversary of TKE in 2019, it is good to be reminded of what an amazing organization these early Tekes created even amidst the trials and tribulations of two World Wars and a Depression.. We can only hope to do their hard work justice as we move into the next 120 years. As it became clear that America would be entering the conflict, the pages of THE TEKE became filled with references to it. These early volumes of the magazine create an intimate look at what it meant to be a Fraternity man in those years. It is a view that is at once both familiar and foreign in their level of interconnectedness. As our Fraters began to ship off to their wartime duties, they sent back letters detailing their new lives. The spirit of community that they invoke gives greater understanding to our often-repeated phrases about the Bond we share. A Bond for life meant that they would use their limited time and resources, to make sure that they reached out to their organization back home to share their experience and ask after the health of their brothers around the nation. In a section entitled Notes From Camp and Trench, THE TEKE publishes excerpts of such letters. In others, we hear from Grand Officers and many other leaders as they share news of our men from the new challenges that they face. 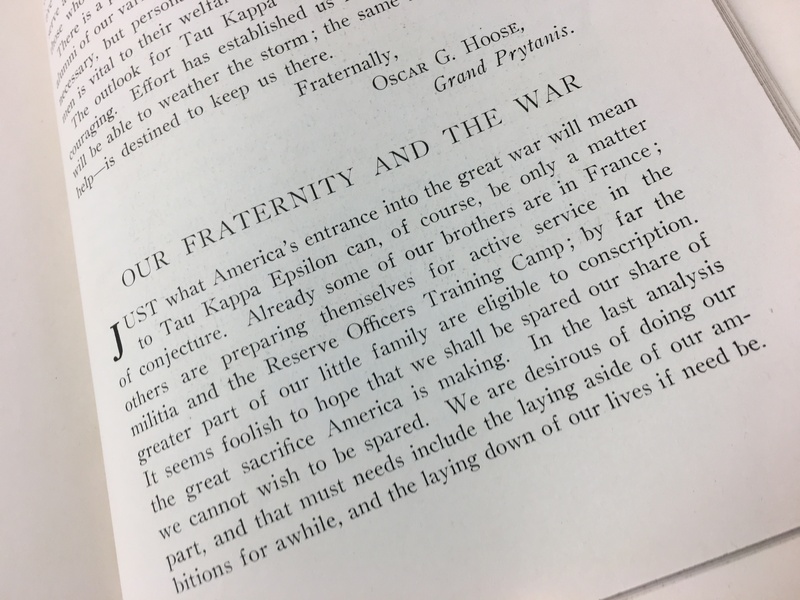 These stories include the men who stayed behind to try to keep our organization alive during the war and they also include stories like this one of unmatched brotherhood from Grand Prytanis Harrold P. Flint (THE TEKE Vol. XI No. 2). "It has always been with genuine pride that we pointed to the unmatched patriotism of those active men of Zeta Chapter, who, in a body of twenty-two strong, enlisted in a unit to fight the battles of the world's freedom. So far as we know there is not a parallel to this act among the colleges and universities of the nation." So as we take time to reflect on what it means to honor our veterans, take a few extra moments to remember those who had their lives forever changed by the onset of a war of the kind that the world had never seen. And remember that among their number were the Tekes that helped to build the Fraternity that you enjoy, even amidst challenges that, with any luck, we will never have to face again. World War I began after the assassination of Austrian archduke Franz Ferdinand by South Slav nationalist Gavrilo Princip on June 28, 1914. The war pitted the Central Powers (mainly Germany, Austria-Hungary, and Turkey) against the Allies (mainly France, Great Britain, Russia, Italy, Japan, and, from 1917, the United States). Four imperial dynasties—the Habsburgs of Austria-Hungary, the Hohenzollerns of Germany, the sultanate of the Ottoman Empire, and the Romanovs of Russia—collapsed as a direct result of the war, and the map of Europe was changed forever. The United States emerged as a world power, and new technology made warfare deadlier than ever before.